Trainer John Moore is already excited by what the New Year may hold after a plethora of his leading lights, headlined by Able Friend, appeared at an informative barrier trial set at Sha Tin on Tuesday (3 January) morning. In particular, Moore was out to establish his hand for the three-race Four-Year-Old Classic Series, which kicks off with the Hong Kong Classic Mile (1600m) on 22 January. The handler sent out six classic prospects at the 12-trial session, but it was Able Friend that stole the spotlight as the seven-year-old stepped out to win the first heat of the morning. 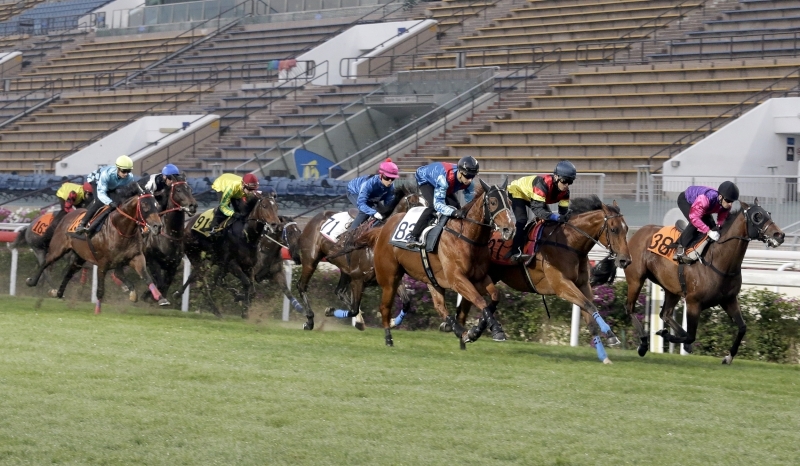 Able Friend (in black) finishes ahead of the rest in the first of 12 barrier trials this morning at Sha Tin. Able Friend has not raced since finishing sixth in the G1 LONGINES Hong Kong Mile (1600m) behind Beauty Only last month at just his second run back from a long injury-enforced break. The son of Shamardal gave both Moore and jockey Joao Moreira positive indications heading towards the G1 Stewards’ Cup (1600m) on 30 January with a half-length to spare over Ricky Yiu’s in-form galloper Jolly Banner in the straight 1000m heat. Before the Stewards’ Cup, Moore’s immediate focus is the Hong Kong Classic Mile, with the trainer sending out the bulk of his potential runners at Sha Tin on Tuesday morning. Behind Able Friend, Australian imports Let Us Win (fourth) and Eagle Way (sixth) had quiet trials. G1 Queensland Derby winner Eagle Way, who impressed when taking the final race on LONGINES Hong Kong International Races day at his first Hong Kong start, is on target for the Classic Mile, but Let Us Win, who raced as Hattori Hanzo in Australia, is still borderline depending on his next run. The second trial of the morning saw Moore’s rising star Rapper Dragon step out under Moreira with a comfortable third, just a head behind unraced Kiwi import Big Flash. Rapper Dragon (3rd right) finishes his trial a comfortable third. One prominent import who will not be seen in the first leg of the Four-Year-Old Classic Series is G1 Grand Prix de Paris (2400m) winner Helene Charisma. The son of Air Chief Marshal, formerly Mont Ormel, made ground from last to finish 10th in his heat over 1600m, with Moore saying the bay was still finding his feet in his new home. Moore’s four-year-olds were capped by rejuvenated galloper People’s Knight and quirky English import Experto Crede, and while he admits it will be tough to qualify the latter for any of the classic races off a rating of 71, he believes that the former may just have done enough to earn a spot in the contest. “Good trial from People’s Knight, very good,” Moore said. “Why not run him in the Classic Mile? He’ll run at Happy Valley next Wednesday (11 January) and then he should be cherry ripe for the Classic Mile. The trainer has won the Hong Kong Classic Mile on three occasions, most recently when he ran 1-2 with Able Friend and Designs On Rome in 2014, and he believes he has the team to match that feat again in 2017.